Dalailul Khairat: Transliteration and English PDF file. Prayers and practices that are recited after the five Daily Salats (Prayers). A must for all seekers! Eating Du’a– Supplication for (before and after) eating food. Fajr Prayer Adab – Practices – Spiritual practices, Awrad, Wazaif, adab, for Fajr (morning) prayer. Healing and Protection Du’as – Naqshbandis’ supplications for Healing and protection includes; Salawat of Healing, Du’a containing Ism ul ‘Azam, Du’a atTawassul with the silsila of Naqshbandi Order, Titles of Qutub ul Mutasarif, Du’a of Sayidena Yunus (as), and more. Protection Against Black Magic Naqshbandi Protection Against Negative Energies includes; Du’a ayatul kursi, Silsila of Naqshbandi order, du’a ulmathur, and Du’a for protection. What is Dhikr? – Meaning of Dhikr (Divine Remembrance), Types, Loudness, relevant Ahadith, and Dhikr of Allah, Hu, Hay…etc. 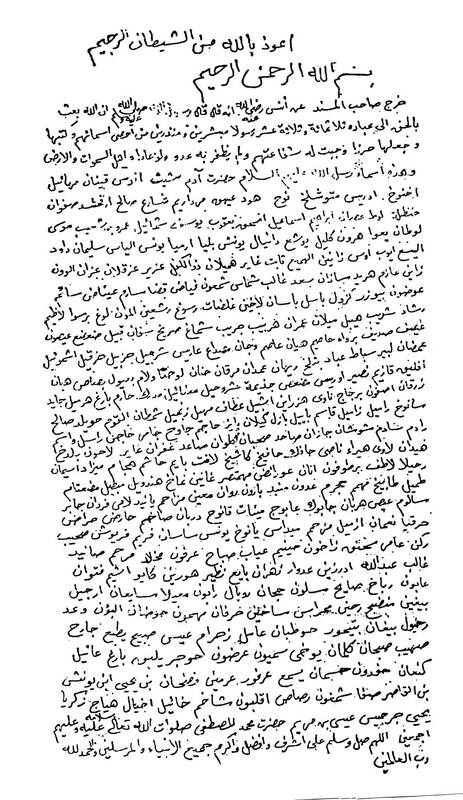 Grandshaykh Abdullah al-Fa’iz Daghestani’s handwritten taweez, for protection. Names of 313 Anbiya (Messengers) – Handwritten by Sultan ul Awliya Mawlana Shaykh Nazim Adil anNaqshbandi.